Lotion bars are a decadent mix of butters, oils, wax and other nourishing additives. The moisturizing ingredients help protect and condition the skin from outside elements. Lotion bars contain all of the goodies that lotion contains, except for water or water-based ingredients. Because no water is used, a preservative is not needed. Beeswax - Beeswax provides a protective barrier on the skin, locking in moisture. Beeswax comes in both yellow and white pastilles. Beeswax has a melt point of about 144°-147°F. Candelilla Wax - Candelilla Wax is a natural non-animal based wax. Plants producing Candelilla Wax grow in Mexico, in the North Central Plains, and the Chihuahua Desert. It is a very hard wax with a melt point of about 155°-162°F. Carnauba Wax - Carnauba Wax is a natural non-animal based wax. It is known as "queen of waxes” and comes in the form of hard yellow flakes. Carnauba Wax has a melt point of about 180°–187°F. Butters - Butters add protective barriers to the skin and help to add emolliency to lotion bars. Butters can include Shea Butter, Cocoa Butter, Mango Butter or any other natural cosmetic based butter or butter blend. Cocoa Butter - Pure Cocoa Butter is thought to reduce skin dryness and improve elasticity. Shea Butter - Pure Shea Butter is high in vitamin and mineral content, which is thought to benefit dry skin. Mango Butter - Pure Mango Butter is thought to exhibit excellent moisturizing properties while countering the drying effects of bar soaps and cleansers. Lighter base oils for a more absorbing lotion bar. Heavier oils for a heavy lotion bar. Fragrance - You can fragrance lotions bars using both fragrance oils and essential oils. The typical usage rate for both is about 2% of the total lotion bar recipe but double check IFRA guidelines to make sure you comply. Smooth & Creamy Lotion Bar Additive - Lotion Bar Additive helps to create a smooth and creamy lotion bar when shea butter is used. Shea Butter can sometimes be grainy. This helps prevent that. The usage rate is 5%. Vitamin E - Vitamin E T-50 is an excellent antioxidant for products containing oils. It will help prevent oils from turning brown and going rancid. The usage rate for Vitamin E is 1%. Botanical Extract - (Oil Soluble) - This extract blend contains Calendula Flower Bud Extract thought to be moisturizing, soothing and possess antiseptic qualities. It also contains Aloe, Irish Moss and Marshmallow. This product allows you to add rich attributes to your formulations! The usage rate is 0.5-5%. Colorants - You can add color to your lotion bars by using an oil-based colorant such as Oil Locking Mica. Tapioca Starch Powder - Tapioca Starch in a lotion bar helps to cut down on the greasy feeling. When added to the melted base it can be clumpy, so stir well. The usage rate is 1 teaspoon for every 4 oz. (115 grams) of lotion bar base. Lotion bars can be molded in individual cavity molds and packaged in metal tins. Be sure that the mold you use fits into the metal tin by length, width and height. Sometimes you have to fill a mold only 3/4 of the way full to have the height fit. An example of this can be found in this video. Notice how the Flowers Guest Mold is filled about 3/4 full to fit the height of the 2” Silver Shallow Metal Tins. Lotion bars can also be poured into lotion bar tubes. This serves as the packaging and also makes it easy for the end-user to use the lotion bar stick. You can see a video on creating lotion bar sticks here. Creating a recipe for lotions bars is super simple! You can formulate your own lotion bar recipe by using the formula below. The above formulation is recommended as a starting point. If you want a harder lotion bar with a higher melt point, use more wax or a wax with a higher melt point. If you want a softer lotion bar that melts quicker on the skin, use more liquid oil or a wax with a lower melt point. Step 1 - Melt the wax and butter in the microwave or in a double boiler. Step 2 - Once melted, add the liquid oil and any additives. Step 3 - Pour into tubes or into cavity molds. Step 4 - If cavity molds were used, unmold and put into tins to package. 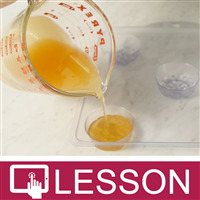 You can find several lotion bar recipes in the WSP Recipe Library, Click Here. "Could I use a triple butter soap base for lotion bars ? " Staff Answer We would not recommend using a soap base to make lotion bars. A lotion bar is made from oils and butters and does not lather. "Do the butters need to be tempered? If so can you do this with the wax or should you temper the butter first then add the wax and melt the wax into the tempered butter." Staff Answer You don't need to temper all butters. Shea is the most common that gets grainy if cooled too slowly. 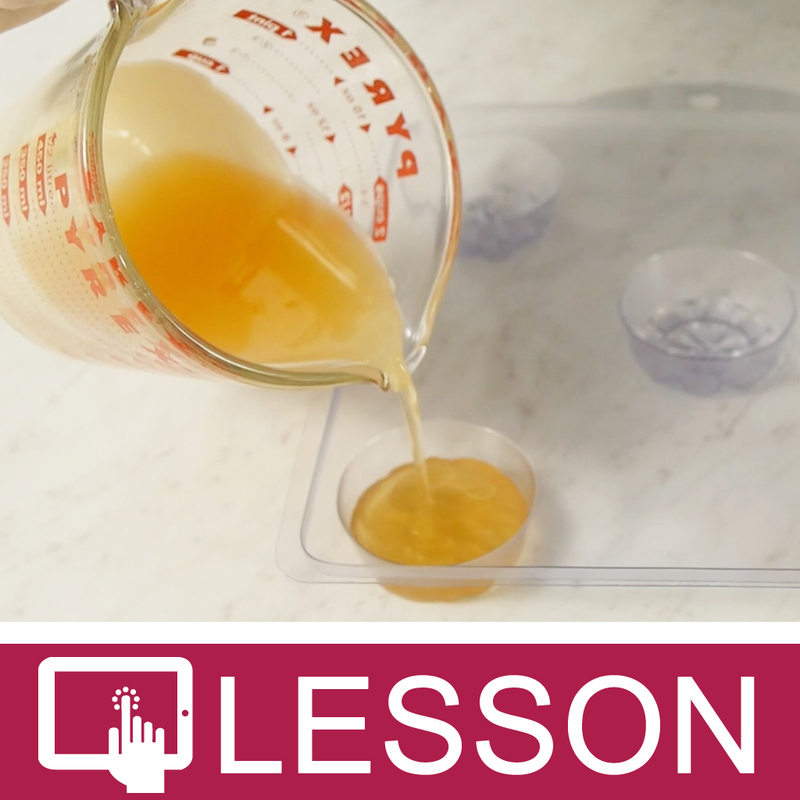 Melt the wax and the butter, combine and rapidly cool by tempering or using a very cold refrigerator. If you have trouble, try the Crafter's Choice Smooth and Creamy Lotion Bar Additive. You won't need to rapidly cool with this ingredient in the formula. "Can soy wax be used?" Staff Answer Soy wax can be used to make lotion bars.